Return of the biased, Vermont-loving, Green Mountain State adoring Cheesewench. 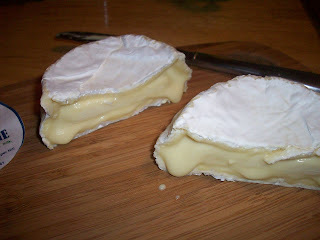 Today I'm going to talk about two new cheeses from two of my favorite cheesemakers. "And so, with crusts of homemade bread this cheese was devoured. The paste is mild. There are some mushroomy, straw and musty qualities to it. Everyone at the table (every one of us spent quality years in VT and NH) agreed that it felt as though we were taking a walk through the woods when eating this cheese. A bit poetic sure, but it's true.The rind had just the right amount of bitterness and tang to make this a really well balanced cheese. I'm going to have a hard time not buying another round today." Weybridge is now a small disk of cheese. It's maybe 1/3 the size of the previous Weybridge. The rind is thinner. The foresty, mushroom-osity isn't really there anymore. I get a little bit of earthiness and some salty creamy goodness. It's just not the same. 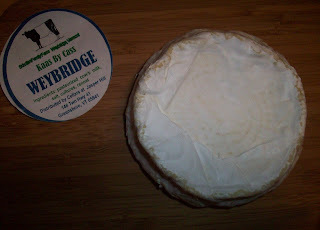 And now the Weybridge looks like this when you cut it in half. Is it tasty? Yeah. It's not as creamy as before, and has a bit of a heavier mouth-feel. Good cheese, but I miss the old stuff. New cheese alert! New cheese alert! From Vermont Butter & Cheese Creamery, Cremont is a combo of three tastes flavors: cow milk, goat milk and heavy cream. The end result is a delicious, heavenly, light, fluffy, airy round of cheese that tastes a bit like a Bonne Bouche and Ricotta had a baby. Lucky for me, we're going to be getting this new cheese in at work. We don't have the Bonne Bouche, but the Cremont will satisfy me until I can get back to VT. I just got the chance to experience a new cheese from VT! 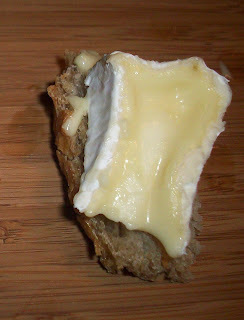 Kaas by Cass is a a soft-ripened cheese from Weybridge, VT. This cheese is an organic, pasteurized cow's milk farmstead cheese. It's no bigger in diameter than a St. Felician, and the flavor is just......WOW! As soon as you open the cheese wrapping your senses are hit with a mushroomy, woodsy type of smell. The rind on this cheese is fluffy and soft, kind of like a baby chick's feathers. This picture was taking about 20 minutes after unwrapping. This cheese was ripe. Visually, we're looking at something that is unctuous, creamy, smooth, and begging to be eaten right away. And so, with crusts of homemade bread this cheese was devoured. The paste is mild. There are some mushroomy, straw and musty qualities to it. Everyone at the table (every one of us spent quality years in VT and NH) agreed that it felt as though we were taking a walk through the woods when eating this cheese. A bit poetic sure, but it's true.The rind had just the right amount of bitterness and tang to make this a really well balanced cheese. I'm going to have a hard time not buying another round today. "This organic cow's milk is all produced by the Scholten Organic Dairy, owned by Roger and Patty Scholten. The whole family is involved in running the farm. The Scholtens promote farming in a manner that improves and sustains the environment, practices good animal husbandry, and upholds personal values where family comes first." Product made with loving care tastes better. It just does.